This commentary was first published on January 18 2017 on the online version of Addis Standard . The author, Dr. Tsegaye R. Ararssa of Melbourne Law School may be reached at?tsegayer@gmail.com. When Prime Minister Hailemariam Desalegn?indicated last weekthat a draft law was prepared on the ?special interest? of Oromia in Finfinnee (aka Addis Abeba), discussions have resurfaced on the issue of the status of the city and its relations with Oromia. Last week, I had the privilege of discussing the matter in a couple of radio interviews where, inter alia, I was asked what the content of the special interest is, what I anticipate the content of the draft law will be, and whether passing the law would address the concerns raised in the Oromo protests that has rocked the country for over two years now. What follows is a set of reflections on some of these issues. This announcement about the draft being prepared on the ?special interest? comes at a time when the country is under a state of emergency the end of which is indefinite even according to the Prime Minister. ?The announcement comes at a time when, in the wake of the Oromo protests against the Master Plan, at least over 700 people are killed by the regime and thousands more are injured. In particular, it comes after key Oromo political leaders?such as Bekele Gerba and Dr Merera Gudina?and tens of thousands of protestors have been sent to jail and military detention centers, respectively, for demanding the right to ownership of their Oromo land including Addis Abeba. The announcement comes at a time when the Oromia and Amhara regions are chiefly being administered by the Command Post in charge of implementing the state of emergency law. The Master Plan, which was once said to be repealed, is reportedly being implemented within Addis Abeba. The boundary between the city and its Oromo suburbs that are still within the administrative jurisdiction of Oromia is not delimited. The repression of all forms of dissent continues. This immediate political context is not without a precedent. In fact, one can say that it is only the continuation of a long-drawn historical context. Before the advent of Art 49(5)? ?The special interest and political right of the Oromo over Region Thirteen [Harari] and Region Fourteen [Addis Abeba] are reserved. These Regions shall be accountable to the Central Transitional Government and the relations of these Self-Governments with the Central Transitional Government shall be prescribed in detail by a special law.? Very much like the provision in Art 49 (5) of the Constitution that came later, it envisaged a ?special law? (meant to clarify the relation of accountability to the Central Government), but such a law was never promulgated. It is interesting to observe that, unlike in the constitution, in this transitional period law, the Oromo has not just a ?special interest? but also a?political right?over the two self-government regions. It is also important to observe that there is no attempt to delimit the boundary of the city. As a result, it was not clear as to where exactly the jurisdiction of the government of Addis Abeba ends and that of Oromia commences. While it looked like a city-state in a federation, Addis Abeba was also seen as a city within a larger state, i.e., Oromia. In other words, administratively, it was an enclave falling outside of Oromia while also housing the Government of Oromia as its capital. In a sense, Addis Abeba is?in?Oromia, but not?of?Oromia. Oromia was a State governing?from?Addis Abeba?without, however, governing Addis Abeba itself. While the meaning of ?special interest? was understood to mean much more than having a seat for the Oromia government in the city, for the entire period of the transitional times, this remained to be the only ?interest? Oromia could obtain. The concept of Oromia?s special interest was thus injected into the language of public law in the country accompanying the shift away from a formerly unitary state to what was subsequently to become a ?multinational federation?. Acutely sensitive to the rights of sub-national groups (called ?Nations, Nationalities, and Peoples?) in Ethiopia, this ?ethno-federalization? was a reaction, and a push back, to the goings-on in history. We can thus see its immense historical import in its potency to speak both to the past and to the future. The ?special? in the ?special interest? phrase hails not only from the mere fact of geographic location of Addis Abeba in Oromia but also from the implicit recognition of the essentially Oromo identity of the city. Historians have routinely described the fact that, until it was violently raided and occupied by the forces of the Shoan Kingdom in the 19th century, the city was inhabited by the Oromo. When it was ?founded? as the capital of the modern Ethiopian Empire in 1886, it was set as a launching pad for the campaigns of imperial conquest on the peoples of the Southern, South-Eastern, and South-Western peripheries. With a violent beginning marked by conquest and occupation of the land; raid, massacre, and displacement of the population; and transformation of the cultural and environmental terrain by the soldiers, it started as a garrison town. A cursory glance at writings by William Harris, Alexander Bulatovich, and even Evelyn Waugh, indicates that the State operated in Addis Abeba as an occupying force of settler colonialists bent on pushing out and displacing the indigenous Oromo peoples. Because the settlers generally spoke Amharic and confessed the Ethiopian Orthodox faith and because of the disproportionate concentration of modern urban facilities in Addis Abeba, it became increasingly different culturally from its surroundings. Consequently, it projected a cultural life that is different from that of the Oromo. The culture, identity, and language of the Oromo became the constitutive outside of the cultural life in the city. In time, the Oromo were effectively marginalized and otherized. For most of the 20th century, the Oromo, although historically the host, was forced to live like the alien and the guest in what was their own homeland. Informed by this memory and propelled by years of national liberation struggles, the politicians that negotiated the Transitional Charter (Proc. 1/1991) and made the law (Proc. 7/1992) sought to emphasize the need to acknowledge the Oromo presence in the city?s affair through the ?special interest?. The ?special interest? package was thus a way of making up for the artificial (created or intentionally produced) absence of the Oromo. In other words, it was a method of presenting the absent, a way of bringing back the Oromo to its own. Addis Abeba shall be the capital city of the Federal State. The residents of Addis Abeba shall have a full measure of self-government. Particulars shall be determined by law. The Administration of Addis Abeba shall be responsible for the Federal Government. Residents of Addis Abeba shall in accordance with the provisions of this constitution, be represented in the House of Peoples? Representative. The special interest of the state of Oromia in Addis Abeba regarding the provision of social services, or the utilization of natural resources and other similar matters, as well as joint administrative matters arising from the location of Addis Abeba within the State of Oromia, shall be respected. Particulars shall be determined by law. ? Owing to the unclarity of the clause in art 49 (5), coupled with the lack, to date, of the law constitutionally envisaged to enunciate the content, it became imperative for people to ask ?just what is the ?special interest??? And what is so special about it? In this section, we make a close reading of the provision to explore what could be in the package. Developments: Toward Articulating the Content of the ?Special Interest? It is important at the outset to underscore that Addis Abeba is a Federal capital city within a State. In this, it is more like Berne (of Switzerland) or Ottawa (of Canada). It is not a city-state (in the style of Berlin or Brussels). Nor is it a federal capital territory or a federal district (in the style of Abuja, or Canberra, or Washington DC). Once that is recognized, i.e., that Addis Abeba is a city in Oromia, one should have an explicit discussion and mutual understanding about what it means to be a federal capital because that automatically indicates that the Federal Government does not have a ?natural? right to be in the city. Unfortunately, that discussion did not happen. That was a historical blunder about a city mired in several historical misdeeds and mistakes. That it was made accountable solely to the Federal Government was the second big blunder committed at the time of adopting the constitution. Given the fact that the city is Oromia and that it is also a ?natural? capital of the government of Oromia, it should have been made accountable to Oromia. Or, at the very least, it should have dual accountability to both the Federal and Oromia Governments. That did not happen. Commanding exclusive say on the administration of the city (in the name of ultimate accountability), the federal government ?banished? the Oromia government at will in 2003 and allowed it back into the city in 2005. In this, the federal government expanded and re-enacted the original violence of dispossession and displacement of Oromos from the city thereby perpetrating a new wound before the historical wounds could heal. Had it not been for this contemporary constitutive mistake, this ?original sin? of constitutional drafting in 1995, there wouldn?t have been anything special about the special interest of Oromia. If there would be ?special interest?, it would have been that of the Federal Government or the non-Oromo residents of the city. These twin mistakes of recent history led to events of dire consequence that continue to claim lives and limbs to date. Having made a guest out of the host through the legal fiction of excision, i.e., by excising the city out of the political and administrative jurisdiction of Oromia, it became necessary for Ethiopia, almost as an afterthought, to ?concede? a lame ?special interest? to Oromia in Art 49(5). Over the years, the government of Oromia and Oromos in general hung on this provision more as a symbolic rallying point to interrogate Ethiopia for what is actually beyond the specific content of the Oromo interest in the city. To the Oromo public, the city became the metaphor for what Ethiopia has made of the Oromo in general: an invisible, non-speaking, non-acting other who inhabits the interior of the territory but the exterior of the polity. It became the concentrated expression of the ?life? and the agony of the Oromo in the Ethiopian polity: their present-absence and their absent presence at a time. Today, the Federal State presided over the coalition of four parties that make up the EPRDF became the new empire in a federal form, and the leaders became the new emperors in a democratic-republican garb. This forced the quip from many commentators that in Ethiopia ?plus ca change, plus c?est la meme chose? (?the more it changes, the more it remains the same?). Hence, the wide Oromo discontent over the whole arrangement with regard to Addis Abeba. Taking advantage of the historic asymmetry in power, the city administration, mostly prompted by the federal government, has consistently acted in complete neglect or wilful defiance of the interests of Oromia and Oromos. Taking advantage of the undefined territorial boundary of the city, the administration continued to expand its competence over the suburbs surrounding Addis Abeba. Routinely, the Federal and the City Governments exploited the legal silence on the matter of special interest. Thus, the Addis Abeba Land Administration office often acted as the authority in charge of land administration in areas such as Labbuu, the Laga Xaafo-Marii continuum, Bole-Bulbula, Buraayyuu, Sabbata, Sululta, and districts beyond the Aqaqii-Qaallittii corridor (such as Galaan, Dukam, etc). The Federal Government continued to implement its industrialization policy by reserving Industrial Zones, Recreation Parks, and designated investment sites (much like Special Economic Zones). In doing all these things, the Federal Government and the city never took the trouble to consult with Oromia, much less the Oromo people. Evictions of farmers with little or no compensation became a routine practice. Pollutions from industrial emissions were sustained with no sense of accountability from the part of the city. Waste was dumped recklessly causing massive health risks. Deforestation and soil degradation was intensified in the neighboring districts, especially after the rise of investment in flower farms, dairy farms, and poultry farms. Homelessness of the evicted farmers and residents started to be felt among the people. The response from the Government of Oromia was late, but it did come in the form of a 2009?Caffee?Oromia proclamation that established a Special Zone of 17 districts and 36 towns in the area. Its attempt at legislative articulation of the ?Constitutional Special Interest of Oromia over Addis Ababa? remained a draft to date. Its demand for enunciation of the content of the ?special interest? by the Constitutional Inquiry Council (CIC) was rejected on the ground that the CIC and the House of Federation do not give an advisory opinion in the absence of litigation. Also, Oromo residents of the inner city resented the absence of Schools and cultural centers that operate in?Afaan Oromo. The fact that the city has become anything but Oromo over the years made Oromo residents lament the complete cultural insensitivity to the needs of the Oromo in the city. Increasingly, the demand for schools in?Afaan Oromo?and cultural centers began to be vocally expressed in the last decade or two (resulting in efforts to construct an Oromo Cultural Centre and to open public schools that operate in?Afaan Oromo)? While such demands were gaining momentum steadily over the years, the Integrated Regional Development Plan (alias the Master Plan) was announced to the public in 2014. Immediately, it provoked a resistance in all corners of the Oromia region. The day-to-day encroachment of Oromia?s jurisdiction with the informal expansion of the city; the general spill over effects of the city; its becoming the dumping ground for Addis Abeba waste for no gain; the pollution of the rivers, the soil, and the general environment of the surrounding districts and towns; the evictions with ?compensations? whose lower limits are legally left unregulated; the insensitivity to the cultural and linguistic needs of Oromo residents; the temperamental behaviour the Federal Government showed vis-?-vis Oromia?s claim to Addis Abeba as its capital city; these and other resentments fed the anger that emerged in the wake of the revelation of the Master Plan. Apart from its violation of the principles of federalism and a healthy intergovernmental relation that should exist in a working federation, one of the reasons given for resisting the Master Plan was that it liquidates the ?special interest? of Oromia. As was noted above, the particulars envisaged to ?be determined by law? were never determined. Giving Content to the ?Special Interest? ?Other matters? similar to provision of social services or utilization of natural resources. In the endeavor to give content to the special interest clause, one is expected to interpret these phrases in a judicious manner that can also satisfy the popular discontent that was ignited into full manifestation in the protest to the Master Plan. In particular, we must identify the kind of social services that Addis Abeba should provide to Oromia. Normally, ?social services? connote services such as access to?housing, education, health, water, transport, and other mattersneeded for achieving adequate living standards. From experience, we know that one of the unmet needs of Oromia in Addis Abeba is access to public buildings and properties for their offices and residential places for their officials and civil servants. And the need for designated plots of land on which to build houses for the employees of the state. Similarly,?health facilities?and other utilities such as?public transport services?that operate in?Afaan Oromo?should be considered part of the social services to be provided to Oromos. One way of addressing this could be making?Afaan Oromo?the co-equal working language of the City Government. The move to make Afaan Oromo and other languages to become working languages of the Federal Government will also help curb part of the problem of access to social services and facilities such as public transport, celebration and registration of vital events (birth, marriage, death, certification, authentication, licensing, etc). The proposed law must also clarify the type of ?natural resources? Addis Abeba has, resources that Oromia uses, and identify the modes in which it continues to use them. The effort to give content to this phrase becomes confounding when we note the fact that there is hardly any natural resource that the city offers to Oromia. Anything ?natural? in the city is?ipso facto?that of Oromia because the city itself is of Oromia anyway. The city actually is dependent on the natural resources of Oromia. Water, forest products, hydroelectric supply, minerals, sand, cement products, precious stones, food products, and everything else that Ethiopia (beyond and above Addis Abeba) needs come from outside of the city, Oromia and the other regions. In the course of articulating this interest, one needs to consider the benefits Oromia should get from the delivery of these resources. One way of doing this is to agree on the percentage of income that should go back to Oromia?s revenue based on what is often called the principle of derivation in federal countries. If the federalism was properly functioning, this would have been handled through a negotiated channel of financial intergovernmental relations. The proposed law to be prepared must determine the scope and method of exercise of the envisaged ?joint administration?. For this, we will first need to identify what tasks are matters for joint administration. Secondly, we need to decide who is responsible for what aspect of the administration. In the area of?inter-jurisdictional roads(say maintenance);?border management; managing?trans-boundary forests,?rivers, etc. ; inter-jurisdictional legal cooperation? (whose police takes responsibility for cross-border criminal activities); these and some such activities need to be spelt out. One obvious area of joint administration is?management of land. Because legislative power over land issues is a matter for the federal government and administration is for the States, issues such as town planning, mapping, cadaster, land redistribution among residents, designing construction regulations, etc should have been a matter for states, districts, and local/municipality governments. And in these areas, local governments of Oromia and the city administration (i.e., sub-cities and districts) could find some collaboration. Accordingly, the government of the state of Oromia and the government of the Addis Abeba City could coordinate their activities as they have overlapping jurisdictions (i.e., Oromia has a territorial jurisdiction while the city has a self-administrative jurisdiction) because the city is also the capital city of Oromia. Ideally, ?joint administration? could have happened if the city was made accountable to the Government of Oromia rather than to the Federal Government. At the very least, joint administration could have been achieved through making the City government accountable to both the Federal and the Oromia governments. Settling on one of these options would mitigate the injustice of the original constitutional arrangement that: a) made Addis Abeba the capital city of the Federal government without the consent of Oromia and Oromos; and b) made the city?s self-government accountable exclusively to the Federal Government. The meaning of the ?other issues? over which Oromia has a special interest is to be decided contextually on the basis of issues that rear their head in the course of day-to-day life experience. One cannot be definitive about the list of things to be included in this category. However, twenty years of experience should have brought forth several such issues that may need to be specified while leaving others to the discretion of administrators subject to judicial review. Even assuming that the content of the ?Special interest? is clear, there is another issue left for us to determine: who comes up with the law that ?determines? the ?particulars?? Is it the Federal Government, the City Government, or the Government of Oromia? So far, the federal government had hesitated to legislate on the matter even in the face of a repeated demand by the government of the state of Oromia. That is of course because the federal government wants to exploit the ambiguity that remains because of the legal vacuum. Legal silence is strategically deployed by the Federal and Addis Abeba Council to avoid their part of the obligation and to continue to enjoy what doesn?t rightfully belong to them in the absence of a law that proscribes it. Oromia?s attempt in the past (2006) to legislate on the matter could produce only a draft piece of legislation that couldn?t ultimately be presented to and passed by the Caffee Oromia. Beyond the Content: Reconciled Relationship between the City, the Region, and the Country-Redemption via Relocation? Designate Addis Abeba as the capital city with a self-governing council ultimately accountable to Oromia?an essentially Oromo city in which the federal government may have some form of ?special interest? Designate Addis Abeba as a federal capital city whose self-governing council will be accountable to both the federal and the Oromia governments. We all know that the constitution-making process was less ideal than one would hope for. It was marked by lack of legitimacy on procedural and substantive accounts. ?The work required now, while attending to the immediate needs of giving content to the ?joint administrative issues?, is to identify potential areas of constitutional amendments that would overcome the problems caused by original flaws in the constitution. This will force us to engage in?and engage the public with?what I called, elsewhere, a ?redemptive constitutional discourse,? a discourse that overcomes the deficits in original legitimacy, a discourse that ?corrects? the imperfect beginnings of the constitution by also attending to the trauma caused by inaugural violence with which the city was incorporated into, and made the capital of, the modern imperial Ethiopian state. Comprehensively responding to the demands of the?#Oromoprotests?whose rallying cry has been ?Finfinnee belongs to Oromo? (?Finfinneen kan Oromooti!?). The legal relocation of the Federal capital has more transformative potential for the entire polity than the obvious advantages outlined above. It is a restoration of Oromo agency and authority over the decision on what matters to their life in their land and in the wider country. The issue of choosing a negotiated site for a federal capital city is an opportunity to help the wider country to agonize over its history, its state system, its capacity to deal with historical injustice, and its hope of re-building the state on a fairer, more just, and more plural foundation. In short, it allows for a redemptive constitutional discourse to emerge. It has to be explicitly stated however that to remove the Federal Government is not synonymous with removing the inhabitants of the city. The inhabitants will be part of Oromia and like all other people living in the wider Oromia, their rights shall be respected. Yes, there may be some people who work for the federal government institutions that may have to commute to and from work if they choose to continue living in Addis Abeba after the relocation of the capital. Yes, there will also be people who might move to the new capital altogether. But they don?t have to. No one has to. It is important to remember, incidentally, that not all the inhabitants of the city are employees of the Federal Government as such. The federal Government is merely its institutions, agencies, and its workers. That is not the (entire) population of the city. Until that is done through constitutional revision or amendment, it may be necessary to consider the shift of accountability of the city government from the Federal to the Oromia government. It may be imperative for the Federal Government to start?paying rent to the Oromia government as a token?of acknowledgement to their being hosted by Oromia. The quest for a lasting solution should start with identifying unconstitutional laws and policies that violate Oromia?s rights and special interests. Laws such as the one that promulgated the Addis Abeba Charter of 2003 (Proc. 361/2003, especially its article 5), the Investment Amendment Proclamation of 2014 (Proc. 849/2014, especially its provisions regarding ?Industrial Development Zones), and projects like the World Bank sponsored Industrial Zone Projects (such as the Resettlement Action Plan [of] the Qilinxo Industrial Zone (April 2015) should all be rescinded. New laws may need to be issued. An example is a proclamation that governs the lowest threshold for rates and modes of compensation awarded to a farmer in the event of eviction from her/his land. To be sure, there was a 2005 Proclamation (Proc. 455/2005) that provides for expropriation of land holdings and compensation. However, this proclamation, apart from enhancing the dispossessive regulatory and police powers of the Ministry of Federal Affairs, federal and local governments, and of several other agencies, it says little about the substance of the compensation, especially for collective landholdings (about which it says nothing). Needless, to say, as the actual practice of expropriation has routinely demonstrated, even the normative gesture in the law of providing a replacement remains to be more a legal rhetoric than an actual reality, more a juridical promise than a political practice. Recognition of special interest is exception-making. Through a ?special interest? package, a rightful entity extends some rights, as part of undeserved?acts of grace, to another that cannot lay claim to these rights. To Oromia and Oromos, there is hardly anything special about the ?special interest?. The city is naturally and intrinsically part of Oromia. As such, Oromos and Oromia have pre-eminence over the city. They lay claim over the city as their own natural territory. 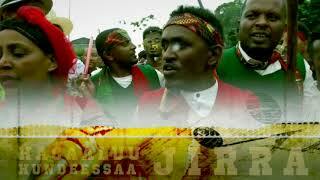 Oromo interests are not supposed to be granted to them by others as some kind of favor. They have the more fundamental right of an owner. As such, they do not need others to make exception in their favor in order to guarantee the protection of the interest of the Oromo in the city. If anything, it is the Oromo that should make exception to the other inhabitants in granting them, for instance, the right of self-government at the municipal level.? In other words, if anything was to be ?special?, it was the ?interest? of other peoples who live in the city that should have been so designated as to constitute the ?special interest? of non-Oromos in this inherently and primarily Oromo city. However, owing to the legacy of imperial conquest and violent occupation of the city and the consequent dispossession and displacement of the Oromo from the city, it is now the guests that are extending (and so far denying) the ?special interest? of the hosts. This is a testament to the total lack of self-awareness on the part of the Federal and City Governments about the land they stand on. It is a testament to their moral blindness and (and the consequent incapacity) to pay attention, to see the original owners of the land, and to recognize their natural rights thereof. The result is the failure to understand the pain of dispossession and relentless quest of the Oromo for restoration. The more consequential result is that this moral blindness is blocking the redemption of the relationship between the city (Addis Abeba), the Region (Oromia), and the Country (Ethiopia). That is why it comes as no surprise that the contestation over the city is pivotal to the making or breaking of the Ethiopian state in our own time.? The substance of most of these reflections were extensively discussed elsewhere. Here, in most sections, I present a rehash of those reflections. See Tsegaye Ararssa, ?The Special Interest in Addis Ababa: The Affirmation of Denial,? Addis Standard (Jan 18, 2016) available athttp://addisstandard.com/the-special-interest-the-affirmation-of-denial/. Technically speaking, this government which needed a special?emergency?measures to secure peace and stability, does not have a legal mandate to enact a law before repealing the emergency declaration and calling the army back to its barracks. Nor does it command a moral authority to make a legislation for the people it killed, maimed, arrested, detained, and tortured unaccountably only because they protested. ?William Harris, The Highlands of Ethiopia (1844). Alexander Bulatovic, Ethiopia through Russian Eyes: A Country in Transition, 1896-1898 (Richard Seltzer, Tr), (2000). Note that the Oromo Cultural Center in Addis Abeba was built and inaugurated only in 2015. See, for example, Ugo Matei, ?The New Ethiopian Constitution,? Cardozo Review (1995),http://www.jus.unitn.it/cardozo/Review/constitutional/Mattei2.html??and? Tsegaye Regassa, ?The Making and Legitimacy of the Ethiopian Constitution,? 23 (1) Afrika Focus (2010), 85-118.